Wazzup Pilipinas TV Airs Soon on IBC 13! - Triple Joys!!! 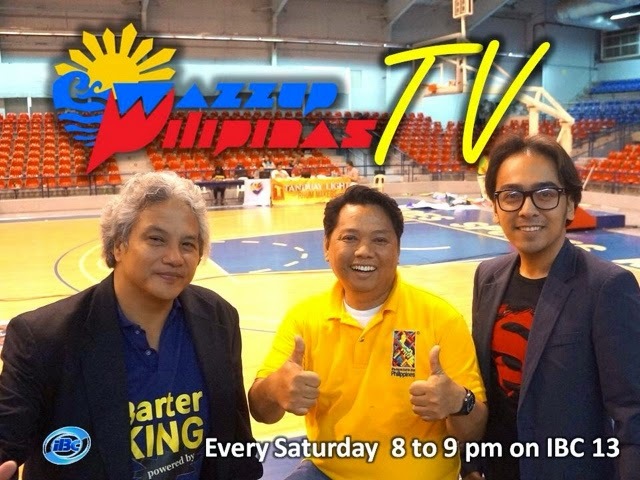 Wazzup Pilipinas TV Airs Soon on IBC 13! WazzupPilipinas.com has definitely grown bigger and stronger even only after two years of being online. After their online media partnerships with many government agencies, brands, colleges and universities, and other organizations, your multi-awarded Pambansang Blog ngPilipinas has indeed reached greater heights when it opened its doors to many more partnership opportunities which included content contributions to newspapers and magazines, guesting on TV and radio shows, organizing media events, advocacy programs and promotional campaigns, spearheading long-term collaborations with more brands, organizations and agencies, and a lot more activities beyond online media partnerships. They are proud to announce that they now have a new TV show dubbed as Wazzup Pilipinas TV and it will soon be shown at IBC 13 every primetime Saturday from 8 to 9 in the evening. It is a varietyinfotainment lifestyle show that will be more than just an online version of the WazzupPilipinas.com blog. We believe this is the first time a blog has made it into national TV making it the first of its kind to achieve an outstanding achievement. The creation of the TV version is truly a proud moment for its founder, Ross Del Rosario, more popularly known as the Pambansang Blogger ng Pilipinas. Ross joins a formidable team composed of Bart Abaya, the Philippine Barter King; Dave Aguila, the Common Sense Investor; Chef Tato, Halal Cooking Master, and quite a number of guest co-hosts appearing all throughout the show. The production team has made Wazzup Pilipinas TV into a witty and intentionally humorous show to make it more appealing to a wider audience but at the same time filled with useful facts and information to educate and inform the more intellectual audience. In short, they tried their best not to make it boring. Lol! The Wazzup Pilipinas TV show also capitalizes on using many forms of media to promote both the show and its sponsors so it is expected that the brands will receive a multitude of media mileage opportunities when they collaborate with Wazzup Pilipinas TV. Since all of the individuals forming the production team and hosts are multi-talented and well-connected with many forms of media and social influences aside from television, all are assured that it's going to be a comprehensive promotional campaign. Wazzup Pilipinas TV is now in the process of taping/shootingfor segments for the show's first season episodes and they would like to invite everyone to be among the very first guests/sponsors of the show to join the many brands they have already partnered with. Wazzup Pilipinas TV can also turn the sponsorship into a long-term relationship mutually-benefiting for all parties involved. They will be more than willing to come up with the best package for interested sponsors. If you are a business owner who would like to be featured in the Wazzup Pilipinas TV show, they would be happy to schedule you for the guesting/appearance/interview as per your availability and convenience. Please let them know when you will be available by sending them your preferred date, time and meeting place. You may email them at wazzuppilipinas@gmail.com and they will contact you asap, or call/text them at 0916 6459045 for faster communication.